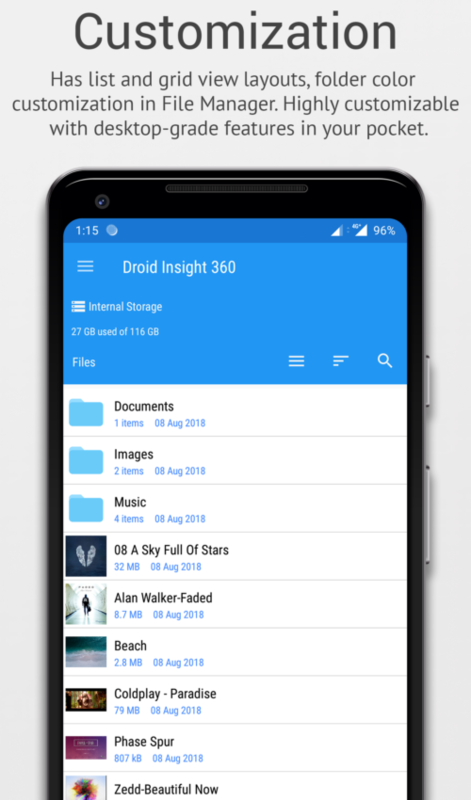 Droid Insight 360 is an integrated and a powerful suite with five apps built into one. Experience five essential apps in one integrated suite. 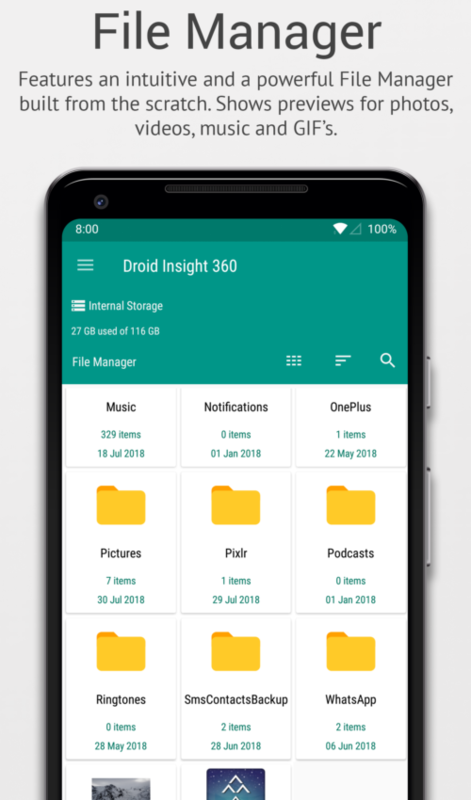 With Droid Insight 360, we aim to reduce the clutter of having redundant and separate apps. File Manager 📁, Benchmark 📊, Device Info📱, App Manager 🔣, Dev Tools 🛠(Root Checker #⃣ and Admob Test ID) – five apps in one, all at an incredibly small size of 3.2 MB. 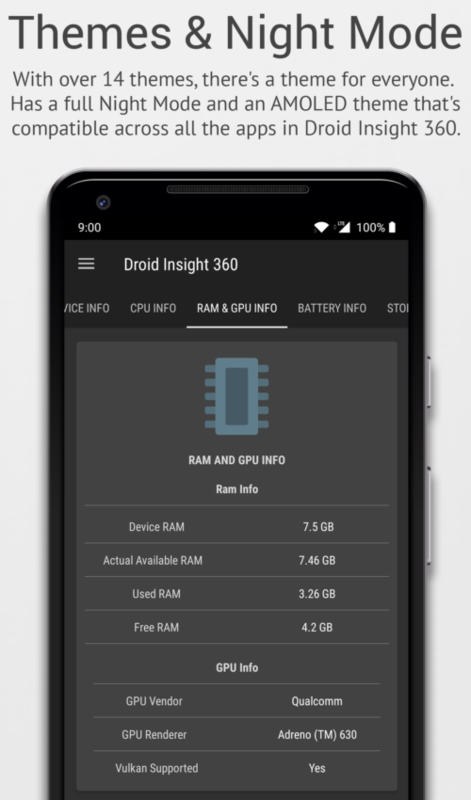 More information on Droid Insight 360 and relevant media are available here. 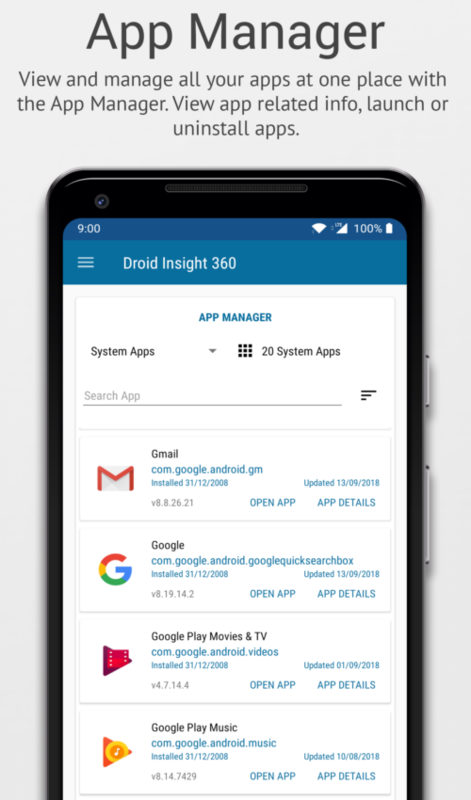 Standalone version of Device Info in Droid Insight 360 with App Manager. Device Info, App Manager and Root Checker in One App. ▪ Features an intuitive and a powerful File Manager built from the scratch. ▪ Shows previews for photos, videos, music and GIF’s. ▪ Has all file explorer actions (open, search, navigate, copy and paste, cut, delete, rename, share, unzip). ▪ Two different layouts – Has list and grid view. ▪ Customize the grid view to display two, three or four columns. ▪ Clean, reliable and fast with an intuitive material UI. ▪ Has over fourteen different themes with a full night mode. ▪ Highly customizable with desktop-grade features in your pocket. ▪ Benchmark your device with a simple yet powerful and a customizable built-in benchmark. 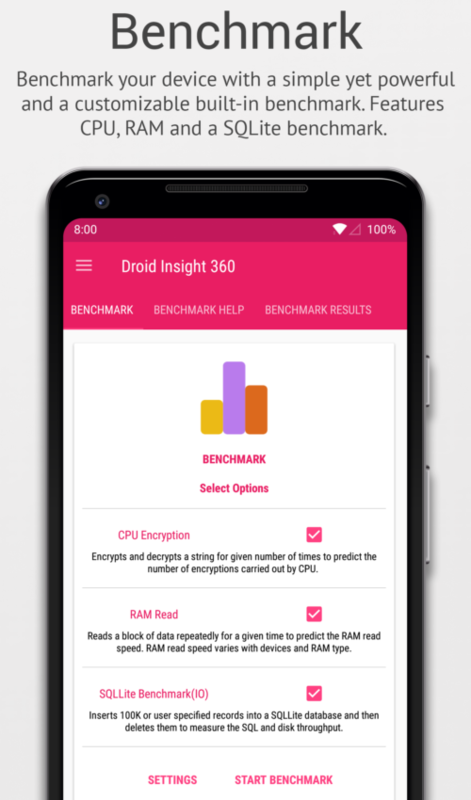 ▪ Features CPU, RAM(read speed) and SQLite benchmark to assess your device. ▪ Share the benchmark results. ▪Get all the essential details (HW and SW info) about your phone. ▪Know your phone’s processor, RAM, SOC, GPU, storage, network 📶, battery 🔋, sensor, real-time RAM/CPU usage and software information. ▪Displays list of all sensors. Search/filter sensors by name. ▪Supports all the themes with a full night mode. ▪ View and manage all your apps at one place with the App Manager. ▪ View app related info, launch or uninstall apps with an intuitive interface. ▪ Shows app count, installed and last updated date along with the version code. ▪ Search and filter system/user apps through app search. 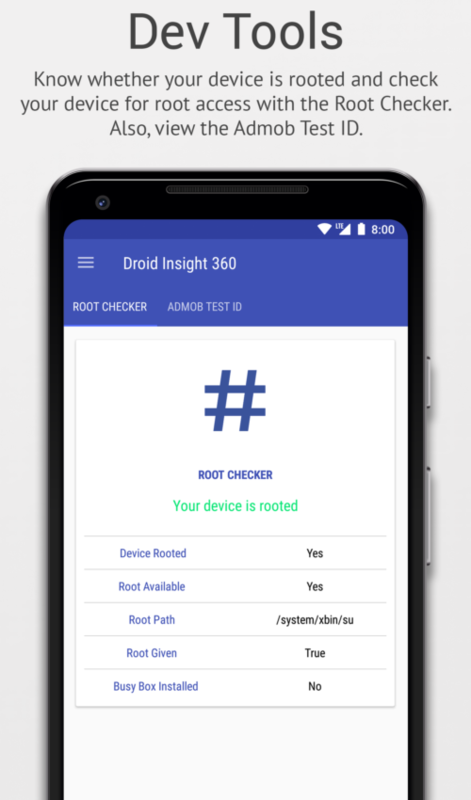 ▪ Know whether your device is rooted and check your device for root access with the Root Checker #⃣. ▪ Verify whether proper root (superuser or su) access is configured and working. ▪ Simple, quick and reliable tool to check root access, root availability, busy box status and root path. ▪ Developers can use the built in Admob Test ID generator to know the Admob Test ID used while integrating Admob into their Apps. 🔹 Has an overview tab that shows real-time CPU and RAM usage. 🔹 Has app shortcuts (Android 7.1 or above) to launch and use the apps separately. 🔹 Has a clean, material design. 🔹 With over 14 themes, there’s a theme for everyone. 🔹 We care for your eyes – Has a full Night Mode 🌜🌃 and an AMOLED theme that’s compatible across all the apps in Droid Insight 360. 🔹 Built for everyone – Built for casual & power users, developers and device testers. 🔹 Optimized to run on a wide range of low end devices with an incredibly low download size of 3.0 MB. 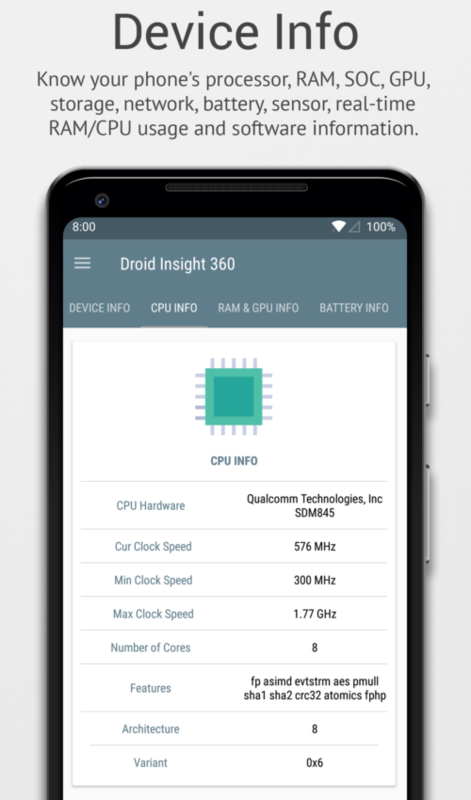 🔹 Droid Insight 360 is optimized for tablets and Android Go. Device Info & File Manager : Secure & compatible from API 21. Crafted with ❤ in India 🇮🇳. – Fixed incorrect path formatting in path display scrollview under Downloads category. – Fixed app search in App Manager. – Added detection for Android Q Beta in Device Info. – Fixed file size formatting in file details dialog. – Fixed a rare ANR that occurred on older Android 5.1 devices. – Fixed slow loading of album art for certain audio files. – Added recently viewed files category to File manager dashboard. – Added favourites category(bookmarks) to file manager dashboard. – Added compact grid view to File manager. A new view mode that displays files in a condensed grid view. – Added option to create compressed zip files in File manager. – Added a new CPU benchmark option – 4500 enycryptions. – Added option to display circular thumbnails in File manager. – Added a new theme – Light blue. – Added min sdk info to App info details in App Manager. – Added board hardware information to Device info. – Changed icons for App manager and benchmark. – Enabled autoplay of gif previews by default in file manager. – Updated app usage help text. – Long press action on the image buttons in File Manager now triggers a short vibration before displaying the hints. – Splash screen for the AMOLED night theme now has the same consistent dark black background. – Hint toast for floating action button in file manager now displays at the correct position. – The last stability and bug fixing patch release for 2.x.x line. Includes various major bug, ANR, stability and string fixes. If you’re using features released in 2.x.x line, please update to this stable release. This version sunsets the 2.x update line and marks the transition to the next phase of updates – 3.0.0 which will be out soon. – IAP and Device info fixes. 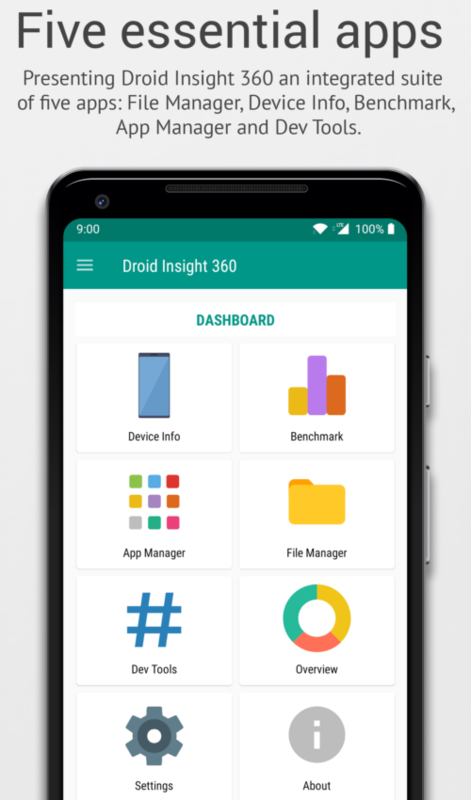 – Changed the app icon with a new design that highlights the core components of Droid Insight 360. – Added hint toast to image buttons in File manager. Long press action on the buttons in File manager now displays hints. – Fixed a bug that caused certain audio files to be excluded under audio category. – Added an option to launch the current directory in File Manager for a selected item in photos, videos, music or documents. – Fixed a bug that prevented folder creation with names containing the ‘(apostrophe) symbol. – Made four column grid view as the default view mode in File Manager. File view modes can be changed by tapping the viewtype button in the File Manager screen. – Added RTL Support. Fixed incorrect text direction in Right-to-left locales. – Added option to opt out of basic app usage statistics. Users can now disable basic in-app analytics(Firebase analytics) by disabling the ‘Send basic app usage statistics’ checkbox in settings page. Crafted for the user – More transparency, zero analytics, your right to choose. – Fixed media scan for file rename operation on SD card. – Now view more info for apps in App Manager. View app permissions, target SDK, activities, providers, receivers and services. Tap the three dots button shown in the app view under app manager to view the details. – Added EU consent dialog for Ads(Shown to European users). New Year’s resolution – Fix bugs, improve performance and enhance stability. – Major performance improvements. Now open large directories(folders having 10K+ files) in lesser time compared to previous versions. – Folder creation and file copy on SD cards is faster. – Now view photo meta info: picture resolution, captured device model, aperture, focal length and date captured under file details dialog in file manager. – Added APK files category* in file manager dashboard. – Increased size of thumbnails in list and grid layouts. – Fixed incorrect display of thumbnails for certain video types. – Various stability fixes and performance improvements in file manager. – View additional info in Device Info: Display refresh rate, step counter/detector availability, USB host/accessory availability, CPU model. – Now install APK’s in File Manager. – Added option to uninstall apps in App Manager. – Added option to open store page for a selected app in App Manager. – Added option to share apps in App manager. – Added FTP server feature in file manager. Now access files wirelessly on your PC/Mac. -*Added a feature rich gallery mode that displays images, videos or music. View GIF previews, sort or delete files. – File copy optimization for files greater than 2 GB. Now copy/move files greater than 2 GB in lesser time(20 to 30% lesser time than previous versions). *Notes : AMOLED night theme can be unlocked by removing ads. The theme will be unlocked in this update for users who have already removed ads. – File copy/move optimizations(for files greater than 2GB) on low end devices. Enjoy using Droid Insight 360. © 2019. Droid Insight 360 is developed and published by Vishtek Studios LLP. ‘Droid Insight 360’ and associated elements are owned by Vishtek Studios LLP. Vishtek Studios LLP is a registered, bootstrapped, self funded and incorporated LLP. All rights reserved.